Sematext Cloud and on-premises IT monitoring system provides over 40 built-in infrastructure integrations used to monitor across all your systems, apps, and services. Metrics and inventory data such as OS & Network, server, and much more depending on the metrics type your integration sends with control over how data is collected and shared within your organization. Logs where stored data is received through the Elasticsearch API and also through a variety of Syslog protocols. Events such as services starting or restarting, version updates, builds, deployments, alerts, etc. Events are graphed in timeseries charts and these charts can be shown next to metrics or logs components, and together added to your custom dashboards. Essentially, you can report data from any system on your server or hosts by creating your own custom reports. Sematext Infra & App Agent (aka Sematext Agent or Sematext Monitor). The Infra Agent collects OS & Network metrics. The App Agent collects application metrics. The App Agent can run in embedded (aka Java agent-based, aka in-process) or standalone mode. This agent can also instrument JVM-based apps to collect transaction traces and perform on demand profiling. Node-based App Agent, which can monitor Apache and Nginx (including Nginx Plus). 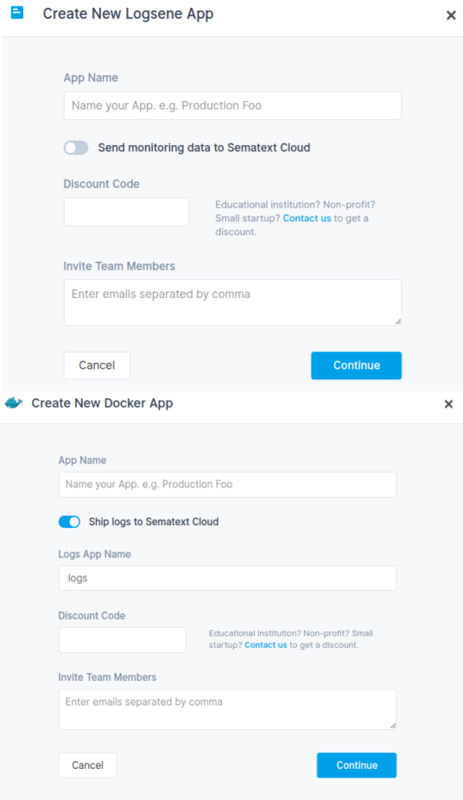 Docker Agent, which can collect not only container and host metrics, but also container events and also logs, it can parse and structure out of the box. Hover over any integration card and click to create respective app or a webhook. Initially, there will be no app status and count tag displayed in the left bottom corner of the card, but once related app(s) have been created tag will display the number of apps, and grey and green tag colour are used to show if apps are not or are receiving data respectively. Image below illustrates an integration card being hovered over and the app status with the count tag displayed with one example app created. 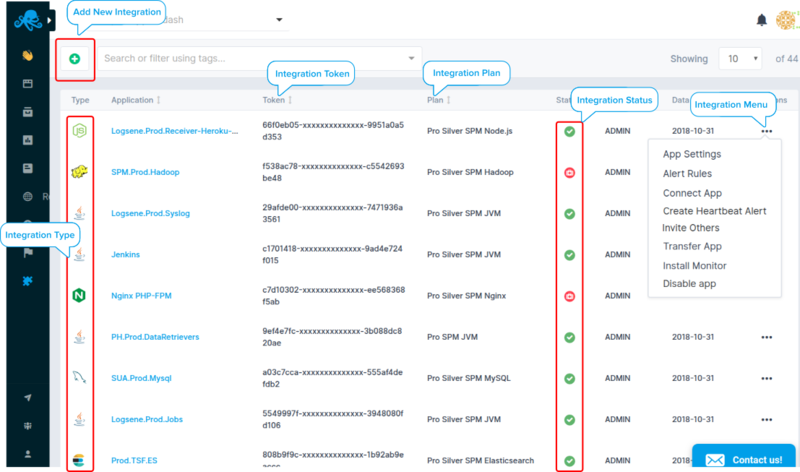 New integration creation userflow is the same for both monitoring as well as logging apps. While Apache monitoring app is being created you can also create complementary logs app as well. It makes perfect sense, and it is the only way to have full observability into performance and issues of the Apache server for example, and that particular piece of a IT infrastructure puzzle. In other words, as monitoring app is being created you can create a logging app as well and vice versa. You can also invite other devops team members and provide them with the same tools and insights while using RBAC (role based access control) model to restrict or provide proper administrative user rights. When an integration app is first created our IT system monitoring platform creates several app specific alerts. User account email is used as a default notification mechanism to send those alert notifications. If you want to use any of the popular third party messaging services that you use in your operations workflow, you can do so by creating related webhook integration. You will first need to create that third party service and obtain required API keys and/or other tokens in order to establish communication between that service and Sematext Cloud. 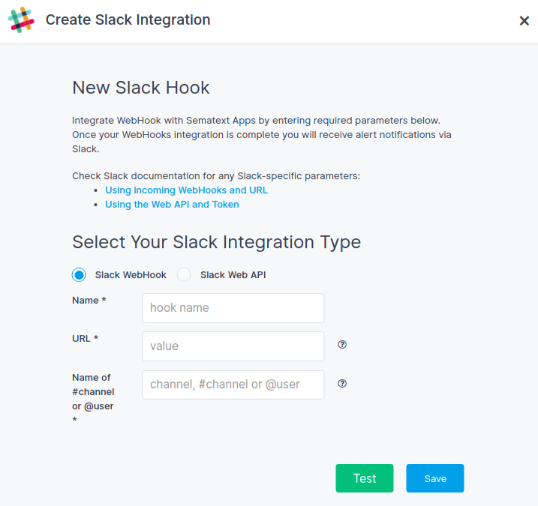 Image below shows a third party notification webhook integration being created, Slack in this example. Integration Token is a unique system generated string that you will need to use on your system in order to install Sematext Integration Agent. It is required to authenticate and establish system connections so you can start sending data to the Sematext Cloud. Integration Agent installation will be covered in more depth in the following section. Last, but not the least, App Settings dropdown menu is the last item in the apps table. Sematext stores data received through the Elasticsearch API and also through a variety of Syslog protocols. In order for the Sematext Cloud to receive data from your systems you need to install the agent on them. 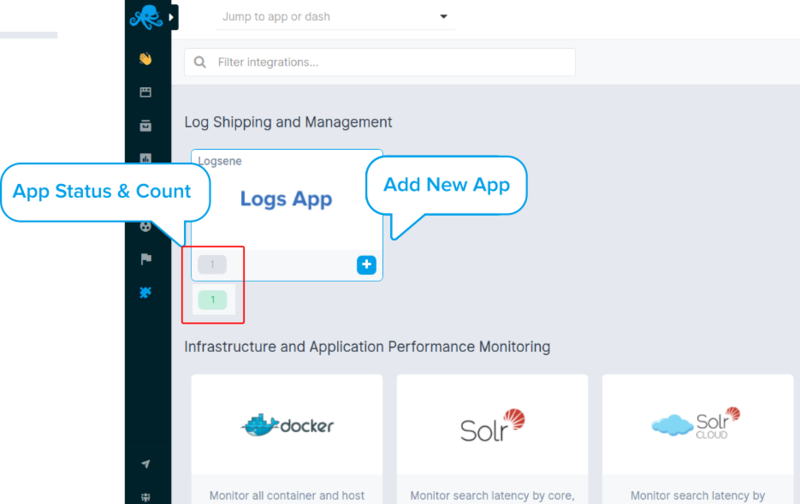 Logging apps require log shipper installation on your end, and information below explains the process. When creating a monitoring app two steps are required, package installation and agent configuration setup. You'll start seeing your performance data in Sematext in a few minutes. If you do not see performance charts in 5 minutes, have a look at Troubleshooting page for tips and if nothing works give us a shout @Sematext or at support@sematext.com. For open-source integrations and other Sematext contribution to the open-source community, check our GitHub repositories. or just talk to us using chat located in right bottom corner of any page, and one of our engineers will help you navigate Sematext waters. Previous What is an App?